This article is the first of a series of three, dedicated to the Oscar award promo cds that are distributed to the people who vote for the oscar nominees and winners, cds that dominated the soundtrack secondary markets since mid December with their overblown prices, extremely high demand and in most cases unique and expanded programs. These cds in most cases present the movie score as it was used in the movie, meaning in the chronological order and duration it appeared, thus showcasing its intended function and scope. This is actually the main reason that these promotional cds are – in most cases – so desirable, including music as it was edited to support the film and also music that was not suitable to be included in a commercial release. As with every year, 2017 academy award promos that were distributed to the voters were many and quite interesting and perhaps you’ll find titles that you were not aware existed. Enjoy reading. 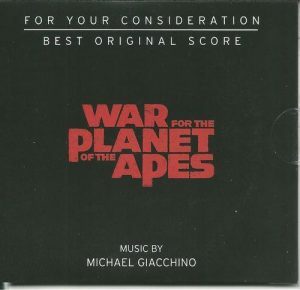 One of the most popular scores of 2017, Michael Giacchino’s music for the third installment to the modern Simian Saga had of course its own For Your Consideration cd promo…actually two cds promo. In my opinion, a perfect blend of previous and new musical ideas, WAR FOR THE PLANET OF THE APES score was an ideal accompaniment for the epic conclusion of the series and was a strong contender for a place in the final five of the music category Oscar. For reasons I don’t want to analyze here, the score was not included in the nominees for best music Oscar, but thankfully a 2CD promotional edition was prepared and is available to anyone who can afford a three digit amount to acquire it. The FYC promo contains around 100 minutes of music from the film in chronological film order, while the commercial release by Sony Classical is around 75 minutes long. The FYC promo contains the film versions, music as it is heard in the movie, while in the commercial cd the cues are developed in a more punctuated way to be more attractive as a listening experience. It is no wonder that the FYC promo is one of the most popular cds right now in the secondary market, reaching prices of 250$ in a January 17th auction (one and only bid), 140$ in a February 9th auction (14 bids) and 130$ as an offer in February 19th auction. Until a label decides to release an expanded edition, this promo will continue to be highly sought after and keep its place as one of the most desirable items of the cd soundtrack market. This is one of the very beautiful cues that were left out of the commercial release of the soundtrack from THE SHAPE OF WATER titled “Going to Work” in the FYC promo. This is a very charming rendition of “Elisa’s Theme” that is played during Elisa’s evening bus drive to work. In this version, Sally Hawkins’ whistling is clearly audible (as it is heard in the movie scene). 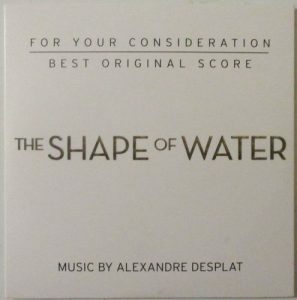 The Oscar winning score by Alexandre Desplat was commercially released by Decca, containing around 50 minutes of score plus 26 minutes of additional source music and songs that were played in the movie. The highly desirable academy award promo that came out in a white paper mini LP jacket sleeve contains around 55 minutes of music that is mostly included in the commercial cd but has a completely different mastering, according to the chronological order it is played in the movie. I could say that it is a unique listening experience quite different than the Decca cd. The FYC promo contains 33 cues in its 55 minute duration, while the Alexandre Desplat score only part of the Decca cd is presented in 19 cues. The promo was first offered for sale during December fetching very high prices, most notably 140$ and 150$ in auction that ended in December 11th and 14th, and gradually the price was diminishing reaching 90$ for a copy that was sold in February 21st in a buy it now offer. 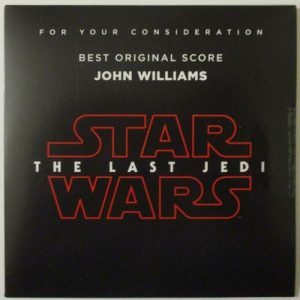 I don’t think that John Williams needed an academy award promo to get his 51st Oscar nomination, nor will you after you listen to the 66 minute For Your Consideration promo cd. Walt Disney Records commercially released of course a very well assembled program of approximately 78 minutes of music from the new Star Wars movie, but it was expected that the collectors would seek and obtain at any cost the promo. Prices speak for themselves, since from the first moment the promo appeared for sale in the secondary market its price escalated to 237,5$ in February 18th (15 bids), 200$ in February 19th (buy it now), 247,5$ in February 21st and 285$ in February 22nd. The FYC promo contains completely different sequencing and presentation of the score that is included in the Disney cd, plus some cues never before released (not something significant or super exciting though). I’m pretty sure that this promo will continue fetching extremely high prices in the soundtrack market, a value that its predecessor (THE FORCE AWAKENS FYC promo) has evidently locked. 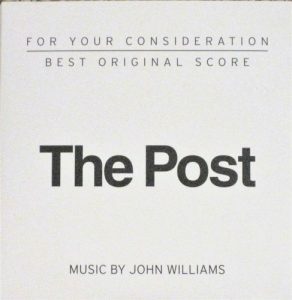 John Williams could have two entries in this years’ music category Oscar list but unfortunately his small but very effective score for Steven Spielberg’s THE POST surprisingly didn’t make it to the final five. Fox released an academy award For Your Consideration promo that contained a program approximately two minutes shortest than the commercial Sony release. The important detail about the contents that mostly interest the completists has to do with the track that is contained in the FYC (“First Class Seat”) and is not contained in the commercial release, plus the two tracks ( “The Oak Room: 1971” and “Two Martini Lunch”) that were not included in the FYC, probably because they didn’t offer to the dramatic impact of the overall score and worked as source cues mostly. The FYC promo has additionally a different mastering and sequencing than the Sony cd. The value of the promo was insanely high when it first came to the secondary market for sale, reaching amounts of 150$ and 360$ in December 10th, eventually declining after the initial enthusiasm around the margin of 80$ (two recorded biding sales in February of 81$ and 84$). These are three cues that are included in the FYC promo program but are excluded from the commercial cds. “I am Tired”, “The Other Conductor” and “The Countess”. This is a case of a FYC promo that really stands out as a completely different presentation in comparison to the commercial cd. Sony Classical released a fine cd program late November with a carefully assembled cue presentation of the Patrick Doyle interesting and colorful score. Early December, the For Your Consideration promo appears in the secondary market and instantly makes a stunning impression by reaching a nauseating 482$ price in an 18 bids auction in December 14th. 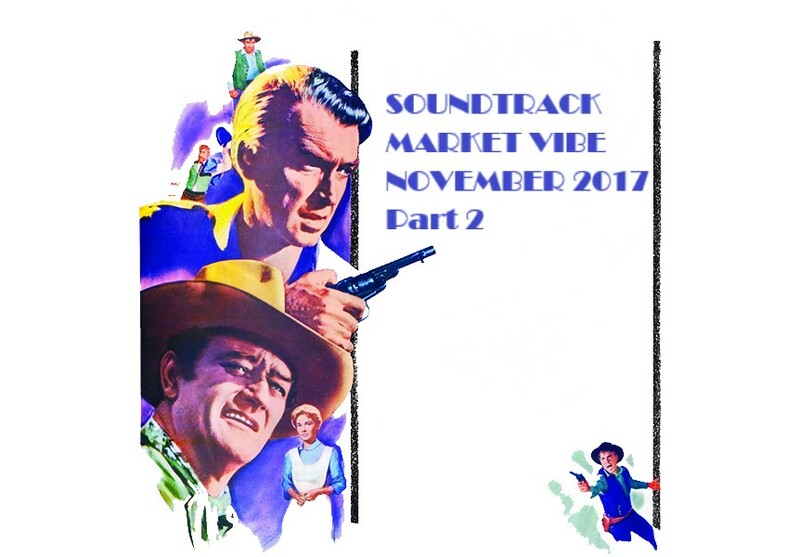 The promo cd easily reaches high prices in auctions because the score is presented as it appeared in the movie with no omissions, edits or trimmings. 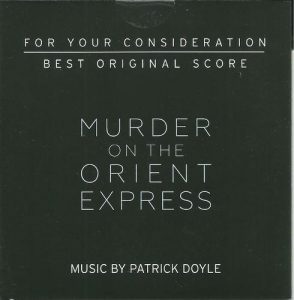 This makes it completely different than the commercial release which offers a prepared for the market release of edited cues like the nine and a half minutes “Justice” that is actually an expanded performance of one of the main musical thematic ideas of Doyle’s score. Especially if you watch the movie and then listen to the promo you easily catch up with the sequencing of the cd, which is three minutes longer in duration (59:41) than the Sony cd. The promo includes 38 cues (many short ones) and the Sony cd contains 24, but I dare to say that the promo flows in a more effective way as a solid movie score and as a listening experience. This cue titled “Ski Mask” is not contained in the commercial release of the soundtrack. One of the sleeper hit scores of the year, Carter Burwell’s music for Martin MacDonagh’s movie was overshadowed by the various classic songs in the commercial album released by Varese Sarabande, but it shines in the academy award promo that included five more minutes of music. I wouldn’t say that there is any significant omission of Burwell’s music in the Varese album but the songs work really distractingly towards the score. 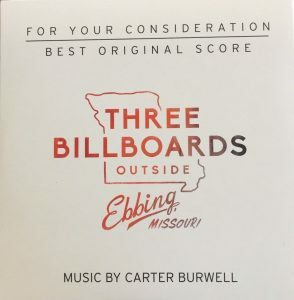 The FYC promo includes every note of score that is heard in the movie, and I believe that it really worked beneficially and was one of the main reasons Carter Burwell received a nomination. Both discs have very short programs of score, the commercial issue having around 21 minutes and the FYC promo having around 26 minutes, however the promo disc reached 100$ in a February auction (4 bids) and usually moved around 40 to 45$ in the secondary market especially during February. One of the unexpected surprises of this years’ Oscars were the omission of Dario Marianelli’s score for the excellent Joe Wright historic drama THE DARKEST HOUR. The score supported the movie’s context in a superb way even though it was very subtle and discreet in its formation and function in the movie. As I described in the Oscar contenders article two months ago, the score has a propulsive energy and dramatic power that highlights the agitation and turbulence of the events of May 1940, when Europe was seemingly hopeless under the Nazi increasing threat. 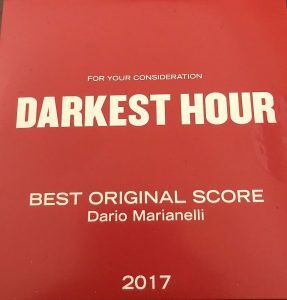 THE DARKEST HOUR score was definitely one of the years’ winners and there is of course an academy award promo that was distributed to the academy voters, except for the commercial release by Deutsche Grammophon. The promo has some brief unreleased – but very interesting – tracks plus a different mastering and sequencing that presents the music in a chronological order as it was used in the movie. The FYC promo has 25 cues (the Churchill-King meeting music is repeated in the program as a End Credits roll track) while the commercial release has 19 and besides the sequencing, the bulk of the promo’s music is included in the Deutsche Grammophon cd. There was only one recorded sale of the promo for the unbelievable amount of 482$ and after this no other copy surfaced for sale which is a bit odd. I assume that if the promo continues to be that scarce, its price will remain in the grounds of a three digit amount. 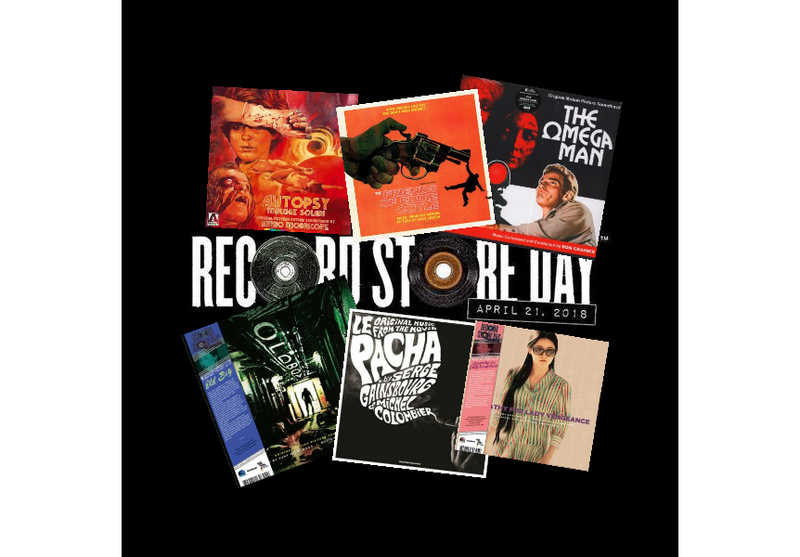 RECORD STORE DAY 2018 – THE SOUNDTRACKS!